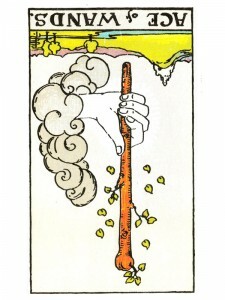 The Ace of Wands (R) provides a true centering on the being within – your karmic purpose can now gently and completely unfold. Awakening – opening of the Third Eye…receiving God’s messages of your lessons to be learned. You may be on the verge of a spiritual breakthrough, but there is a block of some sort. You may very much be a medium through which a great deal is being accomplished. This channel between you and the firmament may be too efficient and thereby picking up more than is appropriate or it may be inefficient and not picking up all that is meant for you. For these inefficiencies to be taking place, there will be obvious difficulties at the lower levels bringing this about; undirected energy or the inability to direct energy beneficially. Wonder and happiness are all around you – even when you cannot or will not allow yourself to see it. You are meant to be fully efficient and receiving everything you need to know to be completely successful on your path. Don’t give up now, just try again – plan it right and use a little more effort. Release yourself, experience who you are – do not hold back any part of yourself. Stay in your truth, be authentic and do not edit, rehearse or try to abandon who you are. Trust and honor your intuition! See yourself clearly committed to releasing any negativity, blocks or obstacles that are preventing you from actualizing your full potential. A true centering on the being within – your karmic purpose can now gently and completely unfold. Awakening – opening of the Third Eye…receiving God’s messages of your lessons to be learned. Spiritual roots – successful completion of spiritual matters but possibly not to the highest of standards. You may be on the verge of a spiritual breakthrough, but there is a block of some sort. You may very much be a medium through which a great deal is being accomplished. This channel between you and the firmament may be too efficient and thereby picking up more than is appropriate or it may be inefficient and not picking up all that is meant for you. For these inefficiencies to be taking place, there will be obvious difficulties at the lower levels bringing this about. You are meant to be fully efficient and receiving everything you need to know to be completely successful on your path. Are you really trying or is there too much activity in your life? Have you experienced too many starts without consolidating your gains, resulting in “clouded joy”? Next to Devil: Someone may feel hurt and is not allowing it to show – take the time now to analyze your relationships. In the first position: Much of this path will be in how you maintain your balance without an air of detachment or even frivolity. Your living must derive from the path itself, in extreme cases even if it means passing the plate. In the second position: Some difficulty in starting deliberate work on your path, in implementing the messages you’ve received. Or, the reverse, that you began in earnest and perhaps too quickly, too forcefully. Listen carefully for updates, elucidation of the original inspiration. In the third position: Be patient with yourself, with the beginnings of earnest endeavors, with the start of the new you. Allow yourself to be used as a guardian angel for someone else; it may require you to speak or act out of character. In the fourth position: Dedication to the Divine may be extreme and so dictate every facet of adult life. Or, may be stuck with the symbology of a profound revelation, rather than getting on with the lesson itself. In the fifth position: Some discomfort/impatience with progress, resulting in delay. Receiving messages, but not fully understanding them. In the sixth position: Spiritual blessings/change in your relationships, your creativity, your extension of self. The impact may be profound – it may affect others around you as much or more than yourself. Your blessings may have been a conduit for those of others as well. In the seventh position: On one extreme, not opening fully to what has already been realized. On the other, an acceptance through abstraction as a means to avoid true openness and the change it should bring. Going through the motions. In the eighth position: A delay in actual physical/material change. The effects of renewal may be astounding, causing a domino effect throughout this plane. In the ninth position: You are at the peak of heart awareness, of the accuracy of your gut instincts, of the positive effect of your subconscious – an infusion of the holy spirit – but the heart is yet to be fully moved. In the tenth position: This fork in your path may close many aspect of your past. There may be more unfinished business than you like as you interpret much as lost opportunities. You will be helped to realize otherwise.